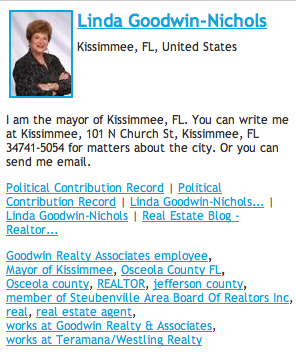 Ms. Nichols is the Mayor of Kissimee, Florida, a real estate agent and a local philanthropist. She is what we at Spock call a semi-famous person. Her data was automatically picked out from thousands of "Linda Nichols" pages and assembled from over 25 separate sources on the web. Pictures, co-workers, political contributions, fax number, mailing address, press articles, etc etc and so forth. A trained researcher at a newspaper would take hours to gather this much information. Forget about trawling social networks and Wikipedia. Tagging your friends is fun but not very useful outside of your own circle. Famous people are easy because there is so much unambiguous information about them. Regular joes like you and I are easy because there is so little. The real challenge and value of "people search" is getting this level of depth for the several million people who are somewhere in between.